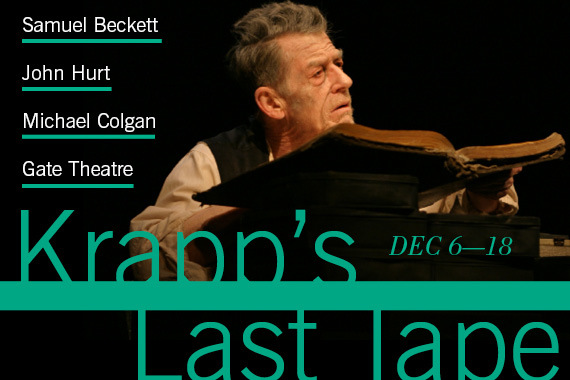 A tragedy in one act for a lone actor, a tape recorder, and many, many bananas, Krapp’s Last Tape is one of Samuel Beckett’s most personal works for the stage—a feat of great precision and tense economy. Featuring discreet details from the writer’s own life, this dramatization of the messy truths of memory and time illuminates the predicament we face when we become strangers to our former selves. Reprising his role in the Gate Theatre’s critically acclaimed Dublin and London production, two-time Oscar nominee John Hurt (The Elephant Man, Midnight Express) plays the titular Krapp, an embittered and dyspeptic man who marks the occasion of his 69th birthday by revisiting his 39-year-old self. Veering from outrage to contemplation, Krapp exhibits the ticks and tocks of a beaten man whose spirit unravels as the tapes unspool in “all that old misery” of lost time.